Marvel's superheroes are coming to Los Angeles and Thisfunktional is giving away some family 4-packs of tickets for some lucky people to go see it. This epic Marvel superhero experience premieres in LA on July 7, tickets on Sale now for all 2017 shows. I will let the winner be surprised when they receive their tickets. Disclaimer: 5 winner will be chosen. Contest runs to June 30, 2017 midnight. No purchase necessary. Prize provided by H+M Comm. Only open to the U.S., no PO Boxes or international addresses. Super hero action, thrills and drama will soar, smash and burst into arenas across the country starting this summer with the debut of the all-new action-packed adventure "Marvel Universe LIVE! Age of Heroes." 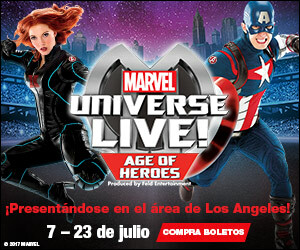 "Marvel Universe LIVE! Age of Heroes" will be playing throughout Los Angeles from July 7–23, 2017 at STAPLES Center/Los Angeles, Citizens Business Bank Arena/Ontario and Honda Center/Anaheim. Tickets on sale to the public now for all SoCal shows. Tickets start at just $25. Called on by Doctor Strange, the Guardiansof the Galaxy join "Marvel Universe LIVE! Age of Heroes" on a momentous crusade against the scheming Nebula who teams upwith the conniving and loathsome villains Loki and Green Goblin. The incredible superhuman forces of Iron Man, Thor, Black Panther, Hulk and Black Widow will unite in clashes that pit student against mentor, sister against sisterand brother against brother. Immersive video projection and cutting-edge special effects will captivate and transport audiences across the universe from the fantastical Savage Land to New York City and beyond. Spider-Man and Wasp’s dynamic aerial stunts along with Captain America’s daring motorcycle skills will be on display in the ultimate race against time to save mankind. July 8 11 A.M., 3 P.M. and 7 P.M.
July 9 11 A.M., 3 P.M. and 7 P.M.
July 15 11 A.M., 3 P.M. and 7 P.M.
July 16 1 P.M. & 5 P.M.
Tickets available for purchase online at Ticketmaster.com, charge by phone at 800-745-3000or in-person at the venue Box Office. July 22 11 A.M., 3 P.M. and 7 P.M.
July 23 1 P.M. and 5 P.M.
"Marvel Universe LIVE! Age of Heroes" will travel throughout North America on a multiyear tour, including stops in Denver, Las Vegas, Salt Lake City, Indianapolis, Atlanta, Dallas, Miami and New York. After North America, the show will embark on an international tour starting in 2019. For a complete list of North American tour dates, locations and to purchase tickets, please visit MarvelUniverseLIVE.com. Members of the media should visit FeldMediaGuides.com/AgeofHeroes for more information and download press materials including photos/videos. Stay current on the latest developments through social media by following us on Facebook, Twitter, Instagram and YouTube —@MarvelOnTour.